There’s no question who will be hurt worse in a California car-truck collision. A truck of any size, that hits an automobile, can inflict tremendous injuries and often death. Chambers & Noronha of Orange County stands alongside victims of brutal truck accidents, pursuing rightful claims for injuries.Truck accidents are unlike other accidents in other ways. Because they are commercial vehicles, their owners are motivated to cut corners by hiring drivers at the lowest cost, training them minimally and pushing them to meet shipping deadlines even when drivers are too tired to drive.Trucks are improperly loaded or overloaded. Driver’s logs may be falsified or disappear altogether. Out-of-state owners can be hard to trace. And it can be unclear who to target in a suit: is it the owner of the cab or the owner of the trailer the cab was hauling? Our lawyers are prepared for all these situations. Our experience, along with comfort working within the courtroom, allows us to win maximum compensation from insurance company lawyers. We assist you in regaining financial health at the same time you heal from your trucking accident injuries. In wrongful death cases, we work discreetly, helping you achieve closure on this most painful event. 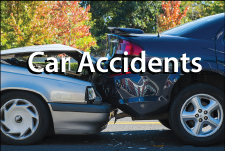 Were you injured by negligence in a truck collision? Call the Santa Ana personal injury law firm that will stand by you. Call 714-558-1400 with questions — or ask our attorneys by email.